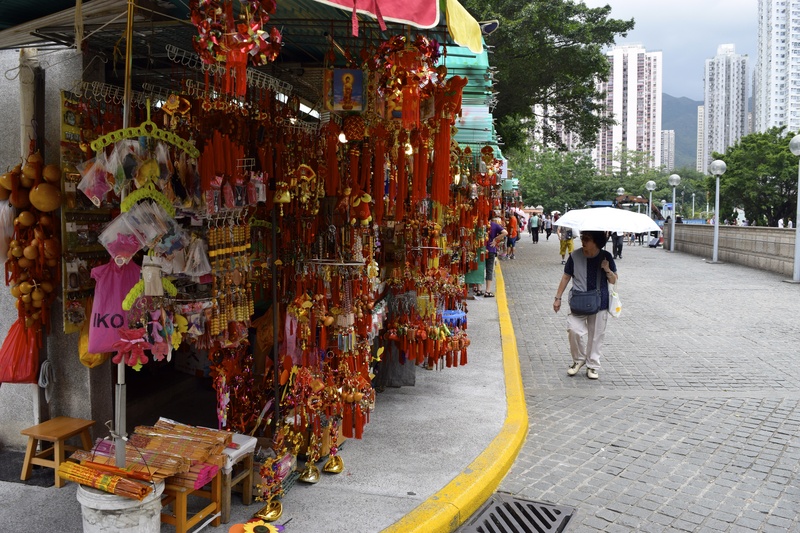 Hong Kong can feel a little over-whelming at times and you might find yourself wanting to seek out a bit of peace amongst the hussle. 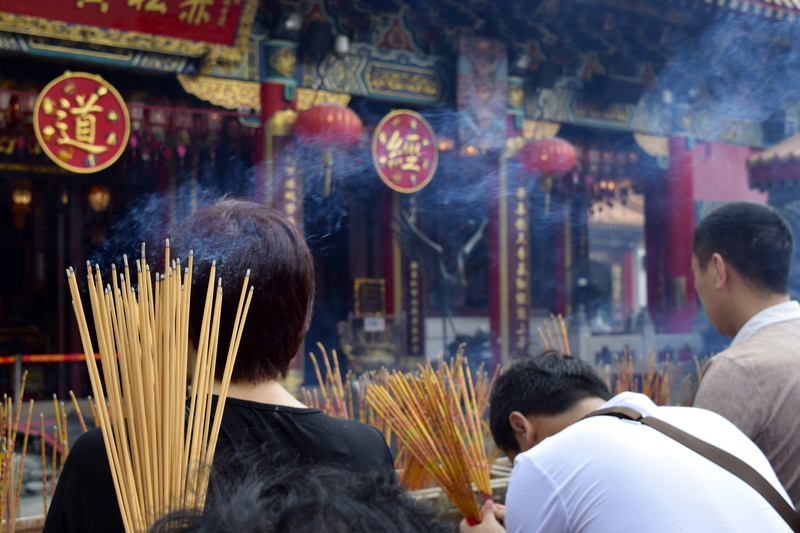 One thing I love about Hong Kong’s culture is the traditional Chinese beliefs and variety of religions that underlie everyday life. 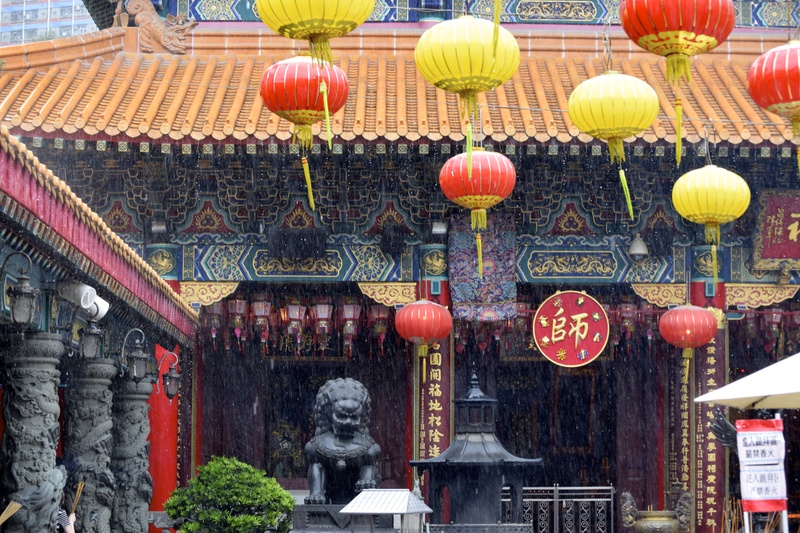 Throughout the city and further are a variety of different temples, each just as beautiful and steeped in tradition and culture. The perfect places to learn something new and to peacefully reflect. 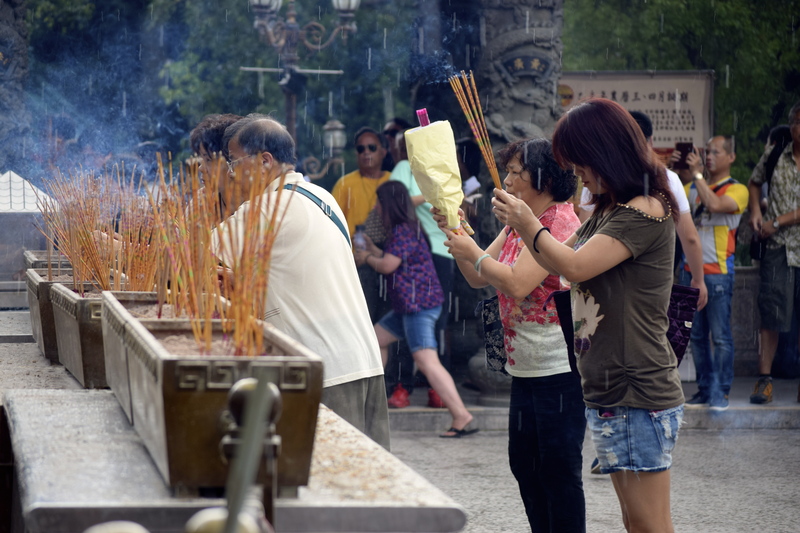 Hong Kong is a religiously diverse region but most of the population follow traditional Chinese folk religions, with a number of people also following Buddhism and Taoism. 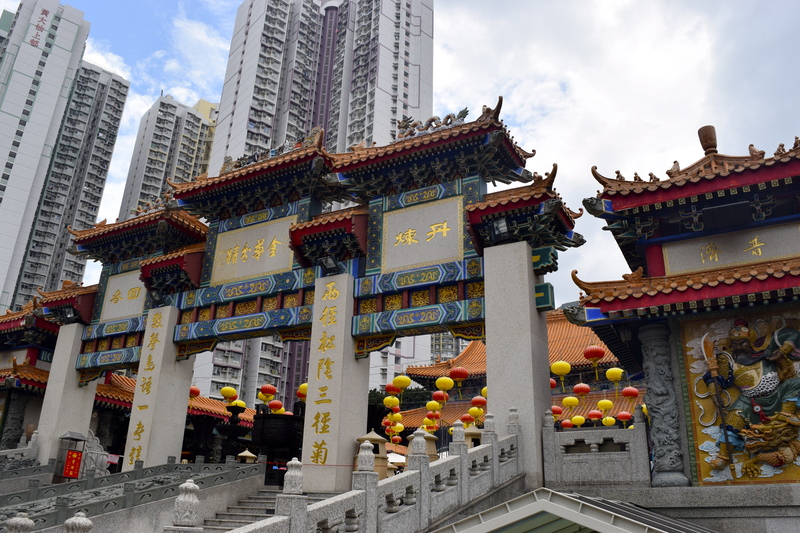 My two favourite religious places I’ve visited in Hong Kong are the Wong Tai Sin Temple and the Po Lin Monastery, the latter of which is also near to the Tian Tan Buddha (the bronze Giant Buddha) which was completed in 1993. 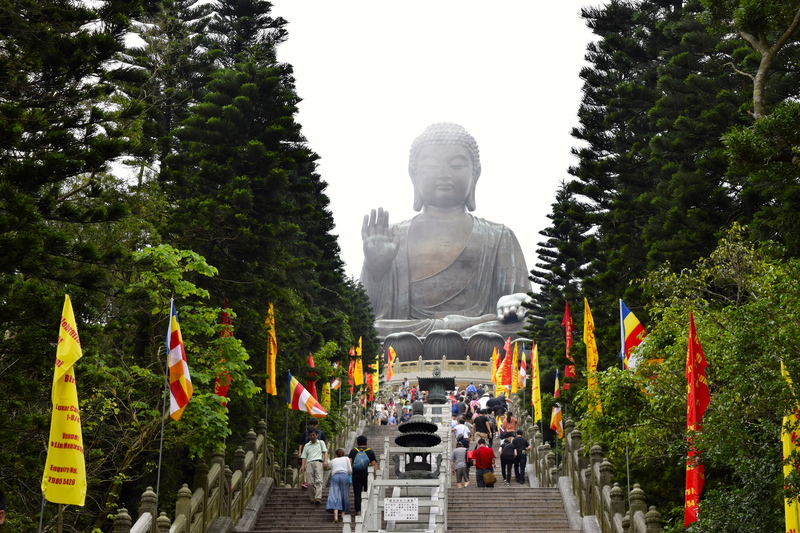 Tian Tan Buddha, high in the mountains of Ngong Ping. 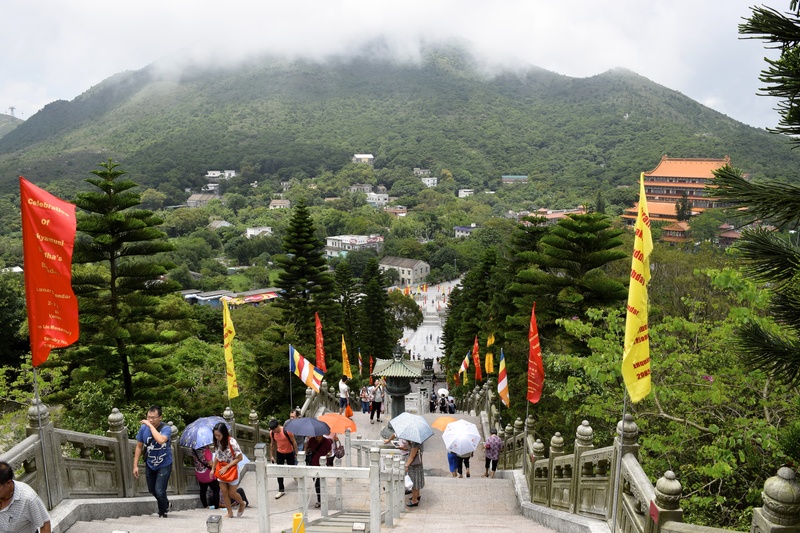 The Tian Tan Buddha and the Po Lin Monastery are set high in the mountains in Ngong Ping on Lantau Island. To get to both, you can take a bus or the cable car from Tung Chung. (For the spectacular views, I recommend the cable car). When queueing up for the cable car, the whole experience will probably start to feel quite commercial and touristy but bear with it. It’s worth it when you get there. The journey up to the mountains by cable car is 25 minutes. 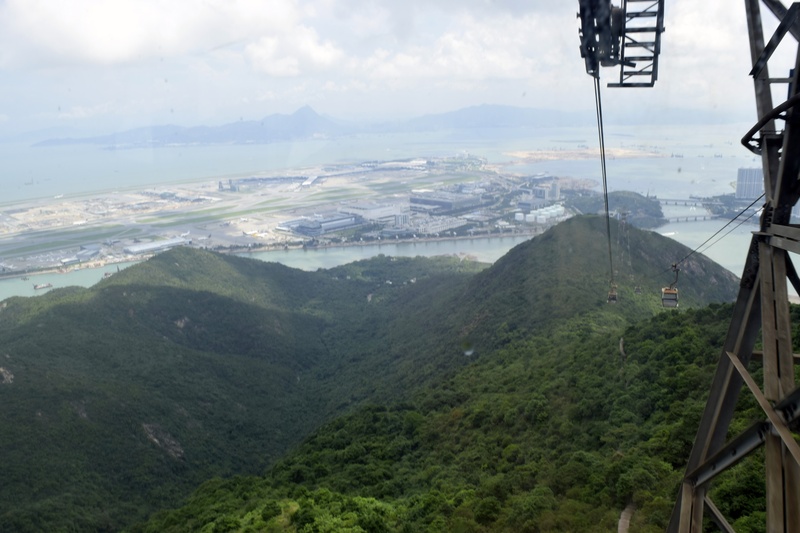 Views from the cable car – Chek Lap Kok airport in the distance and the greenery is Lantau Island. 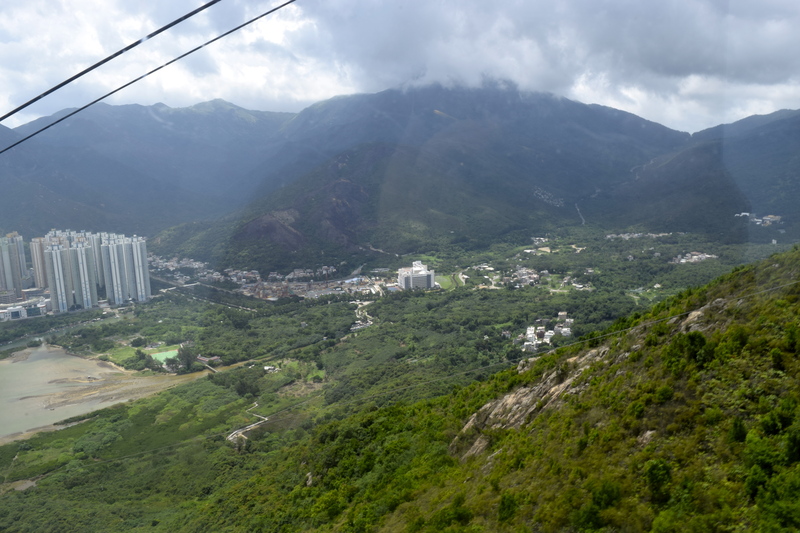 Views from the cable car of Tung Chung/Lantau Island. 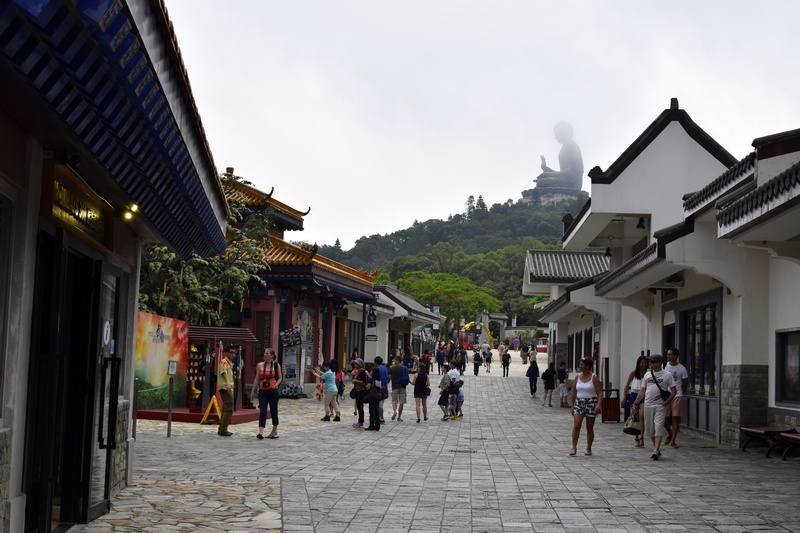 Upon arrival, you’ll enter Ngong Ping Village. Again, this can seem quite touristy but it makes for an interesting walk around and there’s lots of little shops, restaurants, a tea house etc. Straight away, you’ll be able to the Giant Buddha in the distance too! The views at the very top of the stairs/underneath the Buddha are stunning. Definitely make sure you go on a clear sunny day. I was unlucky enough to caught by a lot of mist. 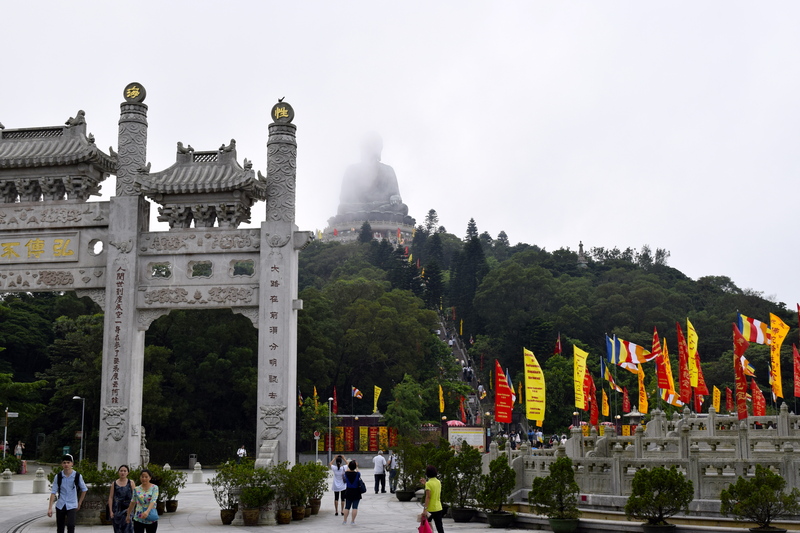 Some say on a clear day, the Tian Tan Buddha can be seen all the way from Macau. 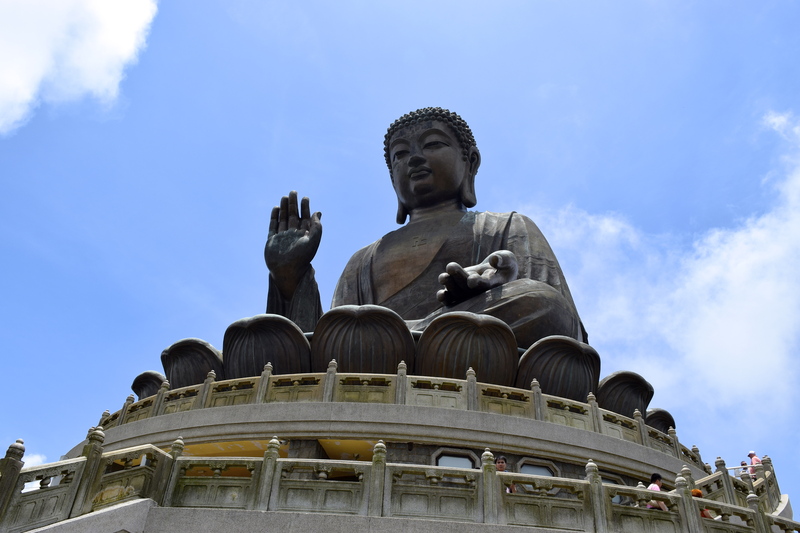 On my most recent visit, I’d timed my trip well enough (by accident) so that I went the week it was the Birthday of the Buddha, which is a national holiday in Hong Kong. 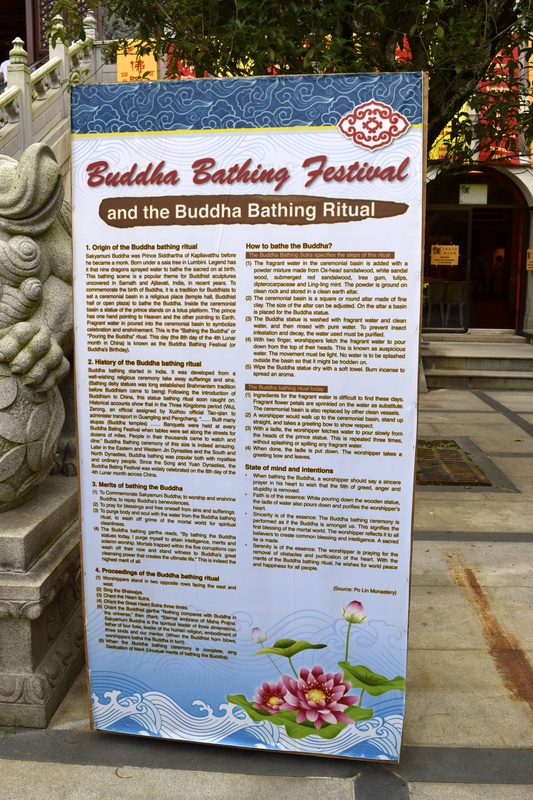 There were hundreds of ceremonial flags around Ngong Ping and a special notice board telling you about the birthday ritual of the Buddha and how he (statues of him) should be bathed which was really fascinating. 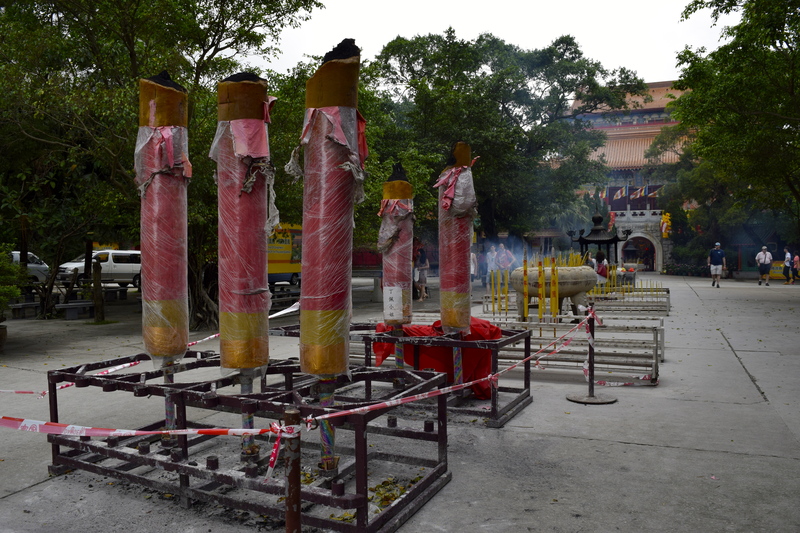 About the rituals surrounding the Birthday of the Buddha. 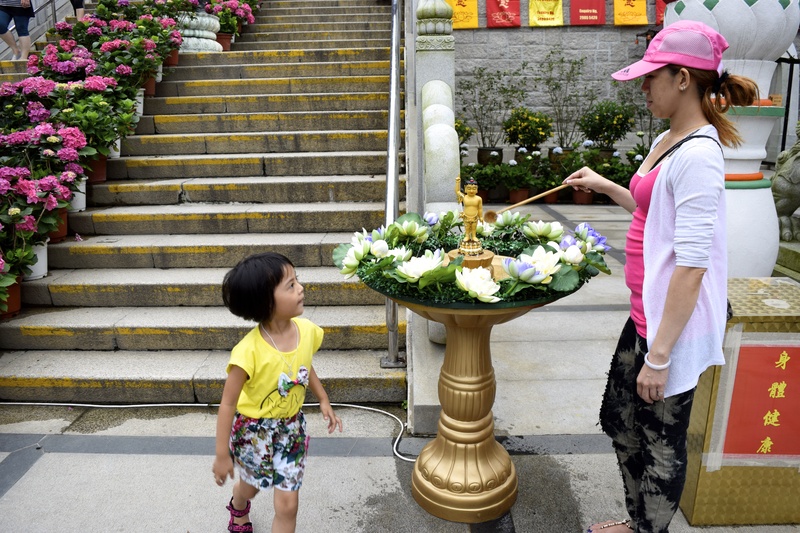 Mother and daughter bathing the Buddha. 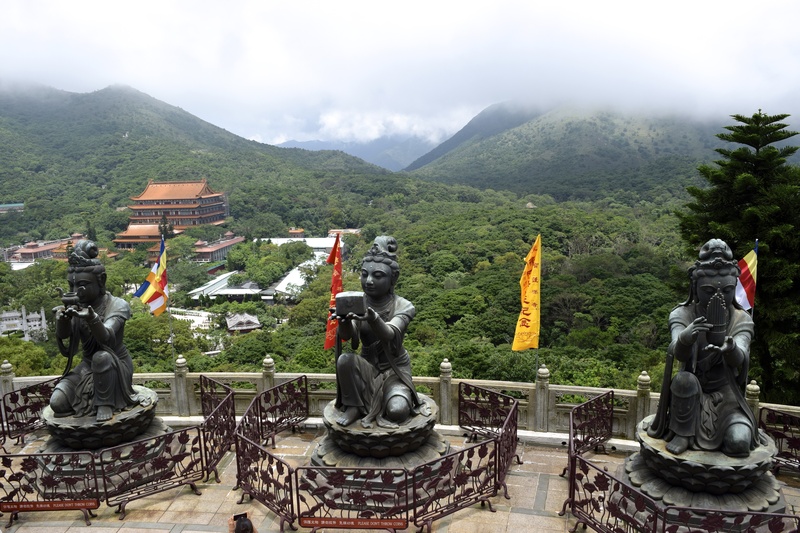 Once you’ve seen the Buddha, I strongly recommend walking further into Ngong Ping to visit the Po Lin Monastery, a Buddhist monastery founded in 1906. The architecture and feel of the place is beautiful. Photos below. 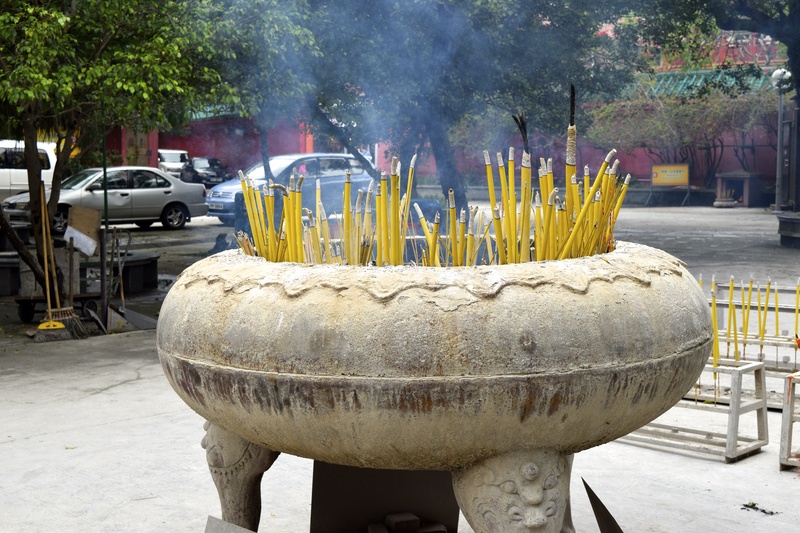 Back in the centre of Hong Kong is the Wong Tai Sin Temple, a Taoist temple founded in the early 20th century and located in the northern part of Kowloon. 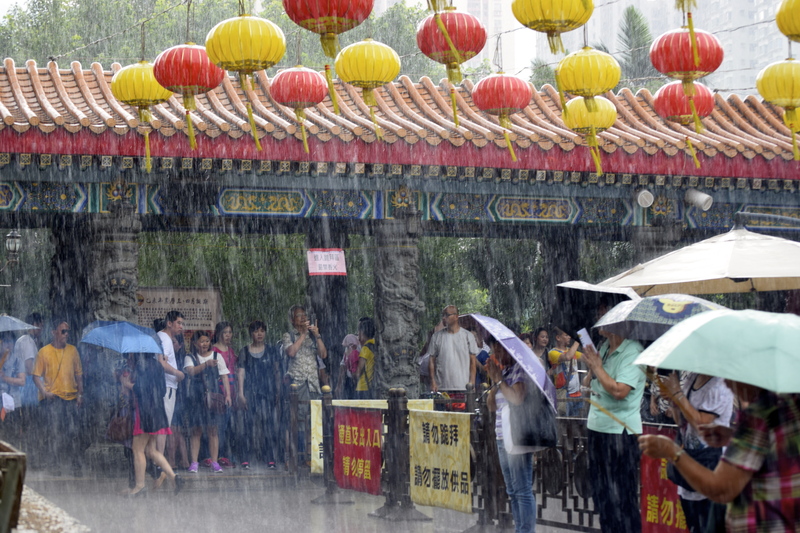 When I went this June, there was absolutely torrential rain out of nowhere for about 10 minutes! Typical Hong Kong. Quite amazing to see how fast all those people praying moved under cover! 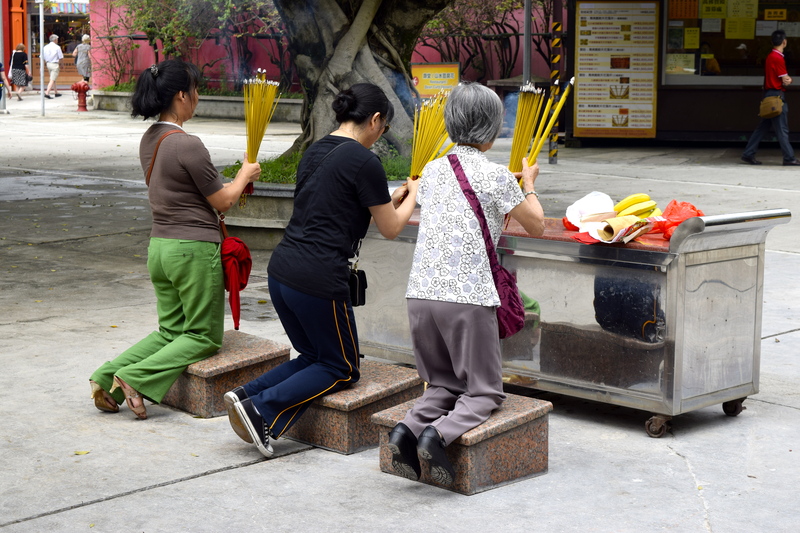 The temple is famous for practicing ‘kau cim’, where an individual kneels in front of the alter and asks a sacred oracle for answers by shaking a pot of numbered bamboo ‘fortune sticks’ until one falls out. This one stick is then taken to a temple interpreter and it’s number corresponds to an already written oracle which will answer the worshipers question. First trip to Hong Kong, aged 13. 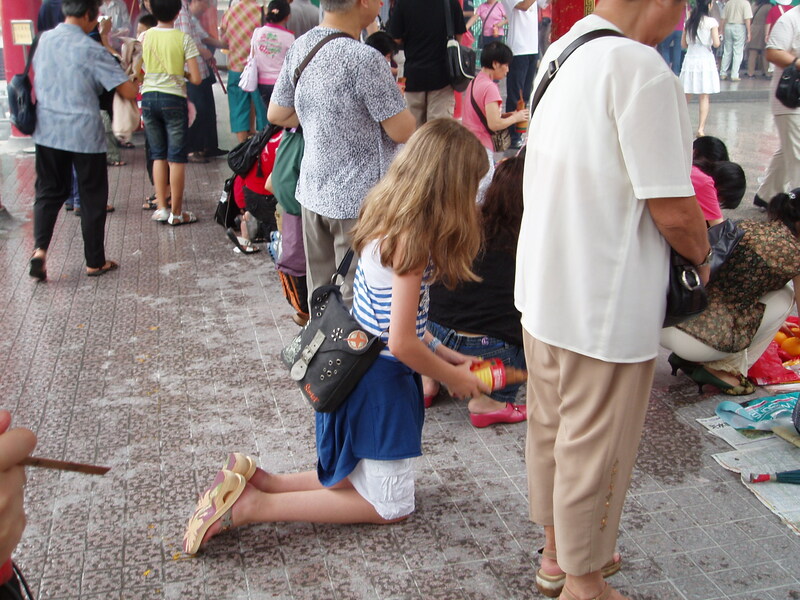 Baby me trying out the kau cim sticks in Wong Tai Sin Temple. I did this myself when I was 13. When I took my stick to the interpreter and told him my date of birth, as requested, I was told my fortune verbally which was I should listen to my parents more and work hard at school. Can’t help but feel this wasn’t a personal fortune and that perhaps I wasn’t the first teenager to be told this! Still, good fun and a memorable experience. 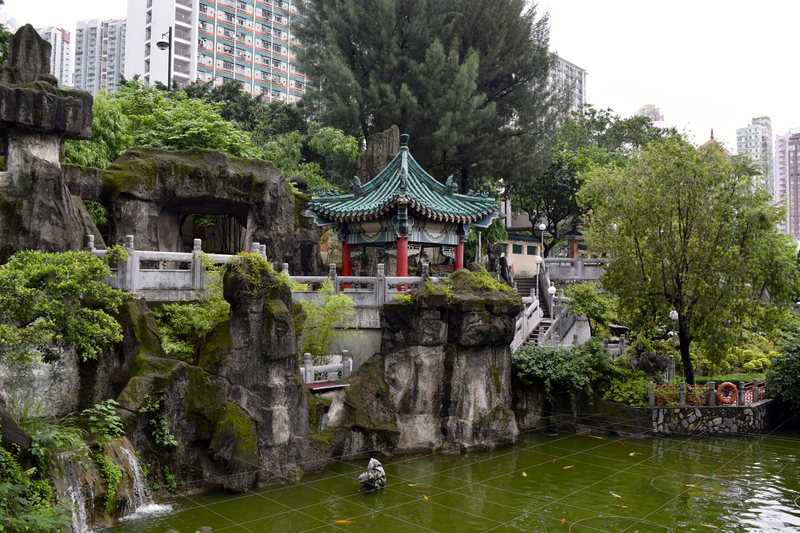 Wong Tai Sin Temple also has beautiful gardens and a pond which makes for a lovely walk around. 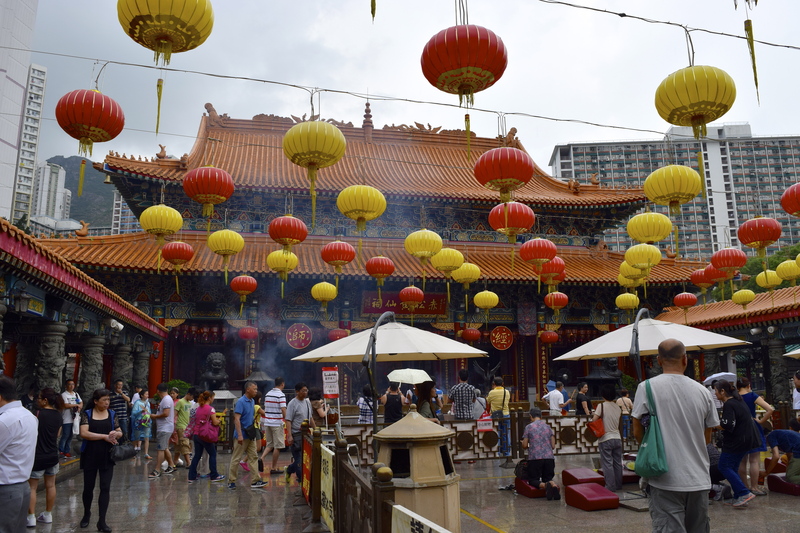 Man Mo Temple in Sheng Wan is also another great one to go to (and is meant to be one of the oldest in Hong Kong), although sadly I haven’t been inside it myself yet. Have you been to any of these temples before? What’s your favourite tranquil spot in Hong Kong?